I can proudly say I stayed up to see the end of the game last night. All 18 innings or whatever. I might have dozed off for a half inning of Tim Stauffer pitching, I can’t be sure. But I made it. The best part was that Clayton Richard finally found his hopefully permanent spot in the bullpen, meaning I get to see Robbie Erlin pitch at Petco tonight. 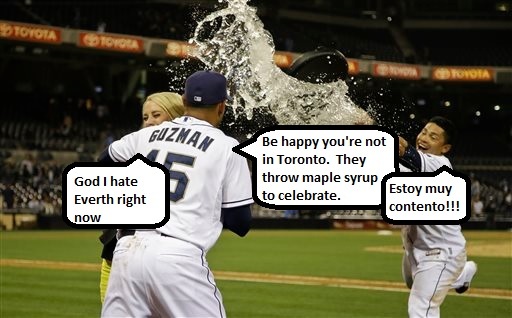 Well that was a good part, the actual best part was when Jesus Guzman was about to get drenched with frigid ice water by Everth Cabrera, grabbed Kelli Crull, and used her as a perfect human shield so he could remain relatively dry before accepting his free certificate from Robbins Family Jewelers later. What a guy! Tonight we continue our relentless assault against the hordes of canucks that are invading dear Petco. I’ll be there crushing beers in 305. Here is last night’s greatest moment captured.